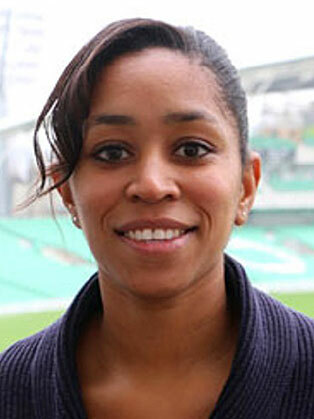 Ebony Rainford-Brent is a World Cup-winning former England international cricketer and the first black woman to play for the national side. Ebony played for Surrey throughout her whole playing career, she started in the under 11’s, before progressing to the senior team. She was captain of the Surrey side which gained promotion to the top flight of domestic women’s cricket, the LV County Championship Division One, in 2011. She was a key member of the England team that won the 9th ICC Women’s Cricket World Cup in Sydney, 2009, and in the three months following, went on to win the ICC Women’s World Twenty20 and Natwest One Day series, while also retaining the Ashes. These achievements secured the team’s place as one of the finest sides in English cricket history. Since taking up her role in the media, Ebony’s career in the industry has been going from strength to strength. In addition to being a match host for Surrey County Cricket men’s games, she has appeared as a guest presenter on BBC Newsround and is an occasional expert and pundit on Sky Sports and BBC Breakfast. In 2012, she got her break on BBC Test Match Special. Initially she was summarising women’s games, though after impressing listeners and producers alike, she was soon asked to contribute on men’s domestic matches. She has since appeared as a TMS summariser for several men’s international matches and in November 2014, it was announced she would be part of the TMS punditry and commentary team at the Men’s 2015 ICC Cricket World Cup. Her introduction to cricket came courtesy of the charity, Cricket for Change, with a one-off opportunity to play at her primary school at the age of 10. Soon after, she was talent-scouted despite having no previous cricketing experience or history. However, her promising cricket career was interrupted by a serious back injury at the age of 19, when she was diagnosed with two prolapsed discs and a pars defect. Her injuries forced her to take a year out from her studies at University College London (UCL),and NHS doctors advised her to give up playing any form of sport. After much needed advice and support from her elder brother, she sought alternative opinions and treatment from numerous specialists. Eventually, the Talented Athletes Scholarship Scheme (TASS) programme made contact with her and provided the necessary treatment and support to aid her recovery. Just under three years later, her miraculous recovery culminated in her representing her country at the 2007 World Series in Chennai, India. Shortly after, she was named UCL Sportswoman of the Year and successfully completed her studies, graduating with a Masters in Chemistry. As well has broadcasting, since her retirement Ebony has gone on to become a celebrated performance coach and a much sought-after motivational speaker. Having overcome a number of obstacles in her life, she is now a huge inspiration to many.